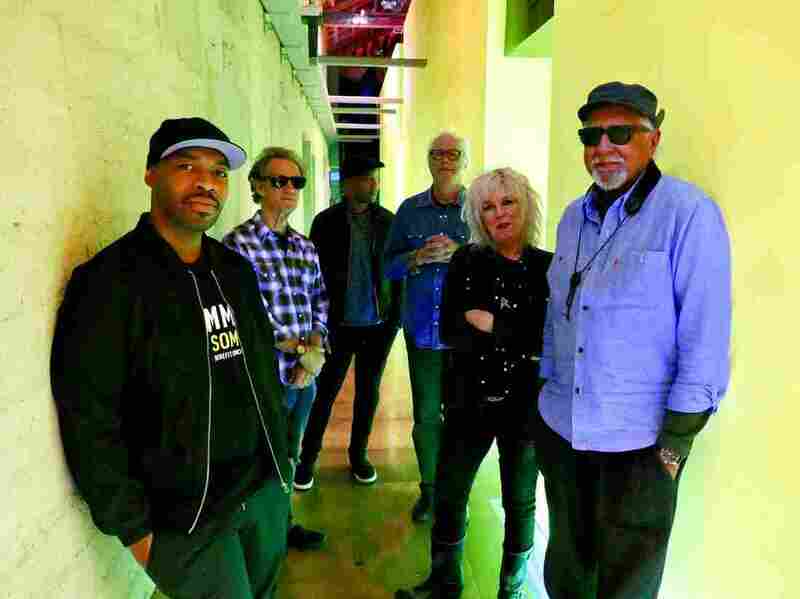 Charles Lloyd & Lucinda Williams Open Windows To Each Other's Souls The veteran jazz master teams up with one of America's most cherished songwriters. Charles Lloyd & The Marvels + Lucinda Williams have their album, Vanished Gardens, out on June 29. There's a pivotal, possibly apocryphal scene in Bob Dylan's Chronicles, Vol. 1, wherein the author walks into a bar. He's taking a breather from a wan rehearsal with The Grateful Dead, circa 1987, in Marin County, Calif. What draws him into the bar is the sound of a jazz combo. "It looked like the last stop on the train to nowhere and the air was filled with cigarette smoke," Dylan writes. Noting the singer in the band, a Billy Eckstine-ish older gent with a relaxed power in his projection, he was stricken with an insight: "Suddenly and without warning, it was like the guy had an open window to my soul. It was like he was saying, 'You should do it this way.'" Vanished Gardens, an enveloping new collaboration between saxophonist and flutist Charles Lloyd and singer-songwriter Lucinda Williams, faintly calls that moment to mind. Not only because Dylan is a lodestar for Williams, and an old acquaintance of Lloyd's. Not just for their version of his "Masters of War," released as a single last year. The album carries a conviction like Dylan's epiphany: that there can be power in laying back and letting the currents swirl. There's more than mutual admiration behind this meeting. Lloyd, an NEA Jazz Master who turned 80 this spring, has a great deal of experience working with poets and troubadours. He also has a bond with guitarists Bill Frisell and Greg Leisz, who have informed the sound of Williams' albums going back 20 years, in Leisz's case, to Car Wheels on a Gravel Road. That album — which appeared on NPR Music's Turning the Tables, and stands as an Americana touchstone — was the one that first alerted Lloyd to Williams. The catalyst for their meeting was an elastic and blues-haunted band that Lloyd formed around the interplay of Frisell (mainly on Telecaster) and Leisz (on pedal steel). Known as The Marvels, it also features Reuben Rogers on bass and Eric Harland on drums, and has collaborated in the past (on I Long to See You, from 2016) with Willie Nelson and Norah Jones. The Marvels have a rambling, rangy style that commingles Southern roots and surf-rock, bebop and Delta blues. Vanished Gardens includes a few instrumental tracks that anchor the group in the porous jazz tradition: a darkly gorgeous "Ballad of the Sad Young Men"; a beatific "Monk's Mood"; a loose-limbed original called "Blues for Langston and LaRue." The opening track is a prayerful dirge bearing the meaningful title "Defiant." But the heart of this album resides, of course, in the tracks with Williams. She brings several of her tunes, remaking them in The Marvels' supple, articulate style. "Dust," from her 2016 album The Ghosts of Highway 20, assumes a buoyant new cadence without losing the desperation in the lyrics. ("You couldn't cry if you wanted to," goes its core refrain.) "Ventura," which crawled along in its original 2003 version, starts out even slower here, but gradually comes into bloom. Even better is "Unsuffer Me," from Williams' 2007 album, West. Harland and Rogers give the song a subtle undercurrent of groove, essentially derived from dub music, over which Lloyd improvises in a plaintive, syncopated bursts. Williams, who begins singing at the top of the track, eventually relinquishes its burden to the band, which runs free with it. Williams also sings "Angel," the Jimi Hendrix ballad, with no shortage of stirring feeling. And on a new original called "We've Come Too Far to Turn Around," a gospel exhortation in dreamy waltz time, she outlines a Dylan-esque catalog of human experience — the wretched and the blessed, the ups and the downs, but always firm in resolve, tilted ahead.